Guitar-Muse just posted a column I wrote on blending dual signal paths to get more definition from your distorted guitar tone. You can check that out here. 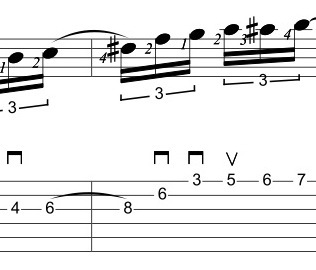 You can find the tab (and the theory behind the lick) here. I have a review of the EHX 8-Step Program coming out soon and another interview in the works for the end of the summer. There are a few recent posts and podcasts on Get-A-Grip that you may be of interest to you. You can find all of those here, and a page of all the current podcasts (with fixed links) here. Some shows are coming up on the horizon which should be pretty cool. I’ll have more info about those up next week. More things in the pipeline as well. Happy 5th of July! Computers, and models and amp sims – OH MY! There’s been a lot of interest in the posts on this site regarding modeling, POD Farm and POD HD. When I made my initial post about this, I didn’t have the 2 units to compare, but I do now and here are my thoughts. I still like POD FARM. For tonal flexibility – it’s really cool. The first thing about POD FARM to recognize is that the amps are more like specific snapshots of amps than fully realized models. By that I mean, if you have a Marshall sound with a killing setting that you dig, then that’s great. But if you roll back on the volume, it’s not going to clean up the way a real Marshall would. There are ways to circumnavigate this (and you can definitely adjust your playing around it), but when playing through it, you’re definitely playing a good sounding model rather than an amp. The second thing is that there’s a BIG sonic difference in the distorted sounds between 44 and 96k. This is to be expected, but there are certain models that are unusable at 44k. On the plus side the laptop functionality of POD FARM is awesome. I can get sounds out of this rig that I could never get out of a conventional amp. I can run two rigs with more pedals than I could ever run live and, furthermore, when I run it through the Atomic tube amp – even the 44k sounds come alive and works well live. Breaking out POD Farm into individual elements is really smart – and very cool. It means that I can run (for example) pre-amps or compressors in my AU LAB shell anywhere in the signal chain. A nice touch. I love AUs. Why? Because when the power goes out at my place for 4 days and I have to type this from a coffee shop, being able to discretely pull out an electric and play in a corner with a set of headphones (and not take up multiple tables) is a GOOD THING! Conclusion #1: If you’re the type of person who like’s to get a great tone and park it – this may be a good option for you. Conclusion #2: If you’re the type of person who wants to reference guitar tones (clean, dirty etc.) but then go beyond that into the stratosphere tonally – this is the unit for you. Conclusion #3: If you want more amp, effect or cab options than you ever imagined – you know the drill. Conclusion #4: If you expect different tones from your guitar when you roll off the volume, or the thought of using a laptop guitar on stage makes you nervous, this may not be the unit for you. This review is specific to the 500 as it’s the only unit I have (and have played through). Comparing this to POD FARM is kind of like comparing apples and onions. They may have a similar shape, but they’re very different things. The POD HD has substantially fewer models than POD FARM. Having said this, the architecture of the modeling is completely different and the tonal detail is stunning. There may be much fewer amps – but they all sound really good. The amps themselves have controls like BIAS, BIAS-X, HUM and SAG that the POD FARM amps do not and when plugging in the guitar signal feels like it’s plugging into an amp. You can roll off the volume and the signal acts in a musical way. As of this writing, Line 6 updated the HD500 and HDPRO w. a new variable input impedance that affects the tone of certain distortion pedals when you back off the volume (so they behave more like the real thing). While the unit supports 96k as an output, the distortions sound good at 44k. Much better than the POD FARM distortions at that setting. As a hardware unit – it has a number of ins and outs. It’s extremely flexible in that way, has a built-in expression pedal and a looper. I’ve never liked USB recording, but the USB recording in the HD works well. The unit has some tricks up its sleeves that are unique. Particularly the particle verb, which is a gorgeous sonic mangler. On the down side – the unit doesn’t have the horsepower that a laptop has so you can’t use any combination of amps cabs and effects on the unit. If you’re using a DSP intensive amp and effect, you can get the DSP limit screen pretty easily. I have some minor global EQ and loop quibbles that you can read about here. For the price point this is a great sounding unit. If you want an all-in-one unit that has the potential to create really musical guitar tones – this may be the unit for you. If you like to get under the hod and mess with things like SAG and Bias to get a good tone – this may be the unit for you. If you need more outrageous non-guitar tones, there are some excellent possibilities on this unit. If you’re the type of person who needs specific distortions, eq, compression or delays to get your tone, and don’t have the patience to chase tone to do so, this may not be for you. So in my mind, PODFARM HD would really be the best of everything. All of the CPU/DSP resources of the laptop mixed with the sounds of the HD unit. Unfortunately, there’s no word on when this is coming out (there’s a lot of new Line 6 gear coming out right now – but even so I’m guessing you may see a demo version at NAMM and then a release in 2013). (A few tips for Line 6 between now and NAMM. Please add global EQ and allow looper wet volume to be pedal assignable. 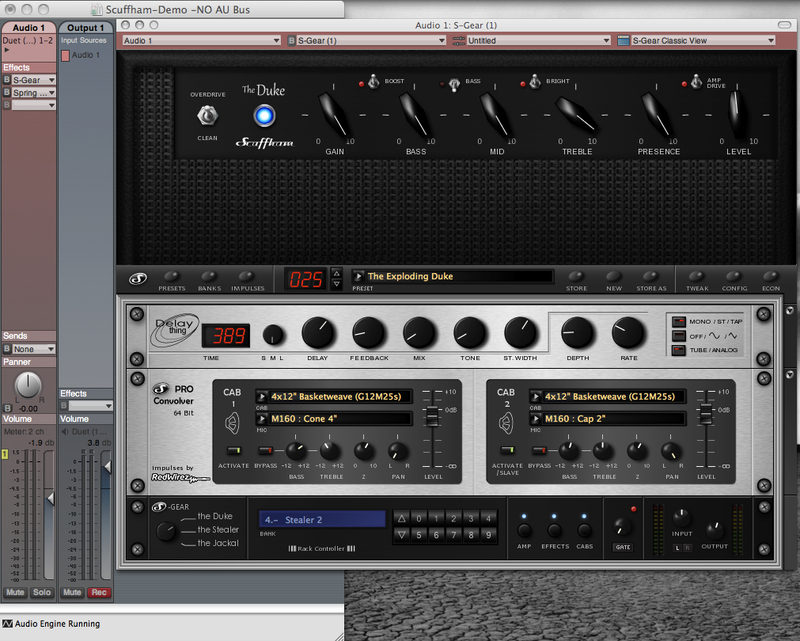 And why do I think that Line 6 may step up the time-table on PODFARM HD? Because despite what the forums say, in terms of hardware, I don’t believe that Line 6 is in the competing market with Fractal Audio. They’re at completely different price-points. AVID’s Eleven Rack however is a completely different matter. 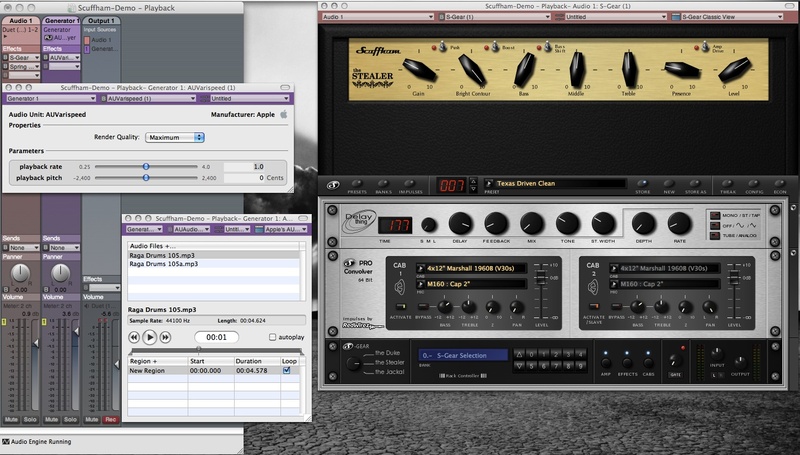 Software wise, you have Amplitube and Guitar Rig as probably the two closest competitors. Both sound good for different things. Both have a lot of the modelling issues that Line 6 has. Only Guitar Rig comes close to the number of effects that POD FARM has though. So why do I have Scuffham Amps in the title of this post? Because Scuffham Amps has something neither of these do. They have the nearest thing to a PODFARM HD AU on the market. I understand that Mike Scuffham was one of the guys behind the JMP-1 (Which was a great sounding pre btw). He’s done something several really cool (there’s that word again – but it’s applicable) things with the design of this plug-in. Limited amps – and specialized limits at that. His “Duke” amp is based on Robben Ford’s amp (a DUMBLE) and has three channels to choose from. The “Stealer” is loosely based on a PARK and the “Jackal” is based on a Soldano. This is cool only because – they’re all really good sounding amps. PRO Convolver and RED-WIREZ IRs. The 64 bit convolver hosts a slew of really good sounding RED WIREZ IR’s (or you can load your own). For someone like me who typically runs IRs in LA Convolver – having them bundled in the AU is a nice feature. Dynamic Power Amp. In addition to the amp drive switch, you all get tweak controls like SAG High Frequency cut and Presence Frequency. FX are limited. It’s got a nice sounding delay, and the gate also works well the amp drive switch acts as like a distortion pedal – but no other fx onboard. This might seem like a small thing, but the presets sound good. There’s a lot of gear a I use where the presets range from ok to trash, but the presets here have really had some attention given to them. I’m not going to put a million mp3s up here as there are already a bunch of them on the site here. I am going to put up what I can get away with in a coffee shop. First here’s the AU Lab session I’m using. The only external effect is a spring reverb. The Stealer has great blues/classic rock tones. But here’s the odd thing, The Jackal has the 80’s metal vibe – but I REALLY dig it’s punchy clean tone and I’ve never really been into any Soldano clean tone I’ve heard. Maybe I’m just not hearing the right ones. For rhythm/lead distortion – I’ve been into the Duke. I think I’ve used that title before…. 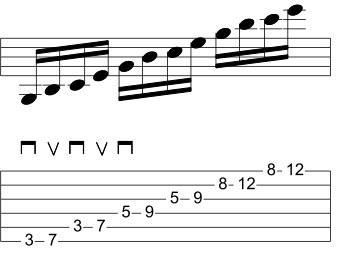 Anyway, here’s the Duke and a favorite voicing of mine – an open E min 9 chord in the 7th position. 2. how even at full volume and distortion you can still make the notes out! For those of you interested in the tech side – this was recorded with an FnH Ultrasonic guitar, neck pickup through an Apogee Duet into AU LAB and Scuffham Amps’ THE DUKE model. Let’s see how cleaning these things up sound with an actual lick. In the previous lesson, I talked about my concept of the modal microscope and how looking at things at multiple levels can help open new perceptions. Let’s take a look at this with the Whole Tone Scale. 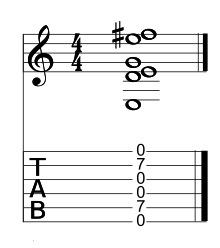 If I have C Whole Tone (C, D, E, F#, G#, A#(Bb) one chord that can be extracted from that is a C7+ (R, 3, #5, b7). However, If we focus on the other chord tones of C7 (C, E, Bb), we can play it over a regular C7 chord with just a little bit o’ dissonance. Since I’ve always done things in C – I’ll move it to G and play a G whole tone (with a few chromatics) over G7. 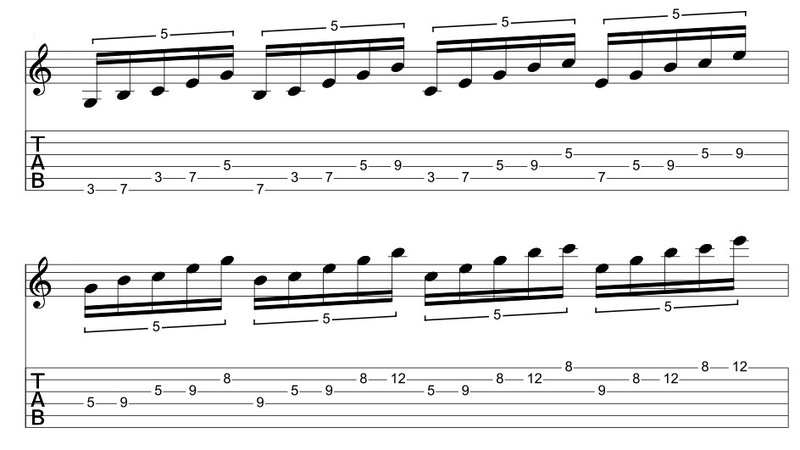 And here’s an mp3 of the lick – with the same volume drop approach as the E min 9. Conceptually, I’m thinking G whole tone from B for visualization purposes (but moving back to the A on the D string for a little melodic velocity). 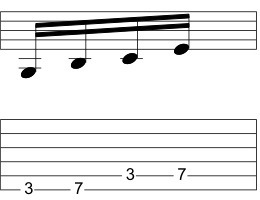 The point is as long as I resolve to either the B (3rd) or G (root) I can sneak this in even if G7 is the I chord in a I-IV-V blues. When I went to Berklee the best harmony lesson I learned was in Harmony IV, when the teacher told me that the whole point of Harmony I-IV was to teach students that any chord can precede or follow any other chord. That means that you can superimpose anything over any chord – but the keys are 1. having the knowledge to resolve it and/or make it work and 2. having the experience and the confidence to go for it. This has been kind a weird lesson/review post (indicative of a few weird days) so please bear with me as I get back to the review aspect of the Scuffham Amp for a moment. On the minus side – I wish this AU had a tuner and a separate reverb built-in. I understand why they’re not – but it’s nice to have a self-contained amp sound. On that note – the amps sound really good and they’re unlike anything else really out there. The list price is $90 – but they sell it online for $75. Some people may balk at the lack of effects, but price-wise this is extremely reasonable for the quality of the amps and the red wirez bundle. Don’t take my word for anything regarding YOUR tone. You can download a fully working demo for 15 days and take it through the paces. Some things will underwhelm you and there some things you will probably dig – particularly for blues/rock tones. I’m still waiting for Line 6 POD FARM HD – which I hope is everything I expect it to be, but in the meantime, I’m using this. If you’re even remotely interested in getting decent guitar tones out of your computer , give the demo a try.